As Ellen Margolis and her fiancé Francine beat their own early path toward marriage equality, Ellen falls into a clandestine entanglement with a wily survivor of the Kaunas Ghetto and a secret search for buried history that very well may disrupt her wedding plans. 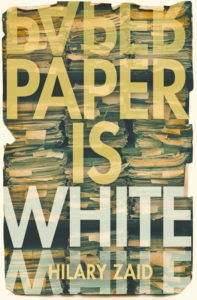 Set in ebullient, 1990s dot-com-era San Francisco, Paper Is White is a novel about the gravitational pull of the past and how it directs and transforms the present. Zaid, whose story “Even in Dreams, She Leaves Me Every Time” appeared in the Winter 2013-2014 issue of Lilith, talks to Lilith’s Fiction Editor Yona Zeldis McDonough about her nuanced and tender debut. YZM: Is the Foundation for the Preservation of Memory in San Francisco based on a real organization? HZ: When I was a graduate student teaching in the undergraduate English Department at UC Berkeley, I began teaching oral history, including a portion of my classes devoted to the Holocaust. At that time, I worked with a coordinator at the Holocaust Center of Northern California to bring survivors from their Speakers’ Bureau into my classes. Those interactions, which happened only on the phone, were enough to give birth to a fictional and grand Holocaust Center in the SOMA District of San Francisco, growing up there alongside the rising Dot Com agencies. In Ellen’s life and imagination, those two worlds live side by side. YZM: Francine finds Ellen’s interest in old women unhealthy—why? HZ: Francine is a fairly sensible person and, according to Ellen, thinks a preoccupation with things that make her sad might be unhealthy. Ellen sees her own work for the Foundation as a way to channel some of her grandmother love into the future instead of the past. Whether Ellen is right on either count is another story. YZM: What was it about the 1990’s that made you decide to set the novel during that time? HZ: Don’t you wish some days that we could set the present in the 90s? Big sigh. I set Paper Is White in the 90s, at first, because I started writing it in 1997, when I first finished graduate school. Career and then children meant that I didn’t get back to writing in earnest until 2005, but the 90s felt very vivid—close enough to live in detail in my mind, but not the present moment, either. Those were also the years in which I was the same age as Ellen in the novel. So, to the extent that Ellen and I lived through the same historical moment, a moment of enormous change for gay and lesbian people, it made sense to keep the focus there. The 90s were also an exciting time in the Bay Area, where the novel is set, a vibrant time before the totality of gentrification had ashed the region in widespread housing insecurity. There was still a sense of possibility. YZM: The novel is framed by Ellen and Francine’s wedding; can you talk about that decision? HZ: Of course, the decision to set a novel in the 90s and to frame it in the story of a Jewish, lesbian wedding are deeply intertwined. Young, queer people coming of age in the 80s were coming out on college campuses, dragging on the tailwinds of the ACT UP movement to create Queer Nation, and beginning to consider the idea that we could and should claim marriage as an institution. A novelist always wants a protagonist to want something and to face obstacles, and that quest to define marriage for herself presents Ellen with no shortage of psychological, social and logistical challenges to overcome. It’s also a quest that allows her to find out who she is along the way in the context of a history so much bigger than herself. I was lucky to find Ellen and her journey! YZM: So with such perfect timing…what’s the one thing you haven’t been asked yet about this novel? HZ: One day I hope someone will say to me, “You were thinking about Paradise Lost, weren’t you?” But it hasn’t happened yet!